Resverigen is an herbal supplement which may support the health of your heart and your body, thanks to its main ingredient: resveratrol. When added to the other antioxidant ingredients in Resverigen, resveratrol may even boost your energy levels and help you maintain a healthy bodyweight. 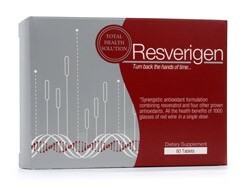 You only need one dose of Resverigen per day in order to obtain maximum benefits. Just swallow two (2) capsules with a meal. This botanical substance may, in addition to aiding heart health, support a healthy metabolism to improve your weight loss efforts. It may also combat lethargy by boosting your daily energy levels. Acai berry is the newest kid on the block in the world of tropical antioxidant botanicals. It is believed to improve overall health and enhance energy levels. Grapeseed is believed to support healthy circulation and hearth health. People in Asia have been believers in green tea’s healthy attributes for thousands of years. Like resveratrol, green tea may boost your metabolism and support weight loss. While quercetin is easily found in many of the common vegetables and fruits at the grocery store, many busy adults don't have time to prepare enough fresh ingredients with every meal. Adding a quercetin supplement to your diet may help you benefit from its health-boosting properties. Resveratrol is believed not only to support heart health, but to also promote a healthy metabolism and give you the energy boost you need to shed unwanted pounds. Resverigen also contains many other powerful antioxidants which are intended to work together in order to maximize what this supplement can do for you.